Monitor Audio Airstream A100 review | What Hi-Fi? Ever since we first tested the Airstream A100, we've been itching to pit this hi-res, AirPlay-streaming, integrated amplifier against its peers. We're taken by its stylish design and composed, insightful sound. But how will this fare against class rival and Award-winner, the NAD D 3020? Stereo amplifiers have come in conventional 43cm-wide rectangular casework for as long as we can remember. Sure, there have been companies such as Cyrus that have strayed from the standard formula but not many. It’s a bit of a surprise that Monitor Audio has been so brave with the A100’s styling. Like its equally ambitious arch-rival – the identically priced NAD D3020 – this amp tries to take integrated amplifier design forward. It can sit flat or perched upright on a plinth. Used upright, it looks right at home next to a computer or even a TV. Of course you can put it on a normal equipment rack, but somehow that feels as though it defeats the point of going for something that looks so radical. Get past the appearance and you’ll find a forward-looking product that recognises the fact an increasing number of hi-fi fans use their phones, tablets and computers for music replay. To that end, Monitor Audio has sided with Apple and incorporated AirPlay. Apparently it tried to include Bluetooth too, but at the time Apple wouldn’t allow AirPlay and Bluetooth to feature on the same product. Apple has since softened its stance on this, and that’s why there are now products on the market with both features. Apple’s AirPlay needs both source and amplifier to be connected to a network. This is easily done. This amp can only connect to the network wirelessly, needing your Apple device to send it the network settings once the two are wired together through the USB input next to the power button. It only takes a minute and, provided your home network is stable, it works well. If you don’t have a network don’t worry. You can connect your iOS device via what Monitor Audio calls Airstream Direct. It gives away the multi-room ability of AirPlay, but it’s a good solution for those that want to use only a single source and amp. Monitor Audio has been careful not to put all its eggs into the AirPlay basket. The A100 also supports DLNA streaming, meaning third-party DLNA apps for Android and Windows can be used for playback. Using DLNA the A100 can stream (up to) 24-bit/192kHz files. This amplifier has a built-in DAC. It’s accessible through an optical input (limited to 24-bit/96kHz music files) as well as through the front USB if using an Apple device. This USB connection also charges the device. There’s a single stereo analogue input too, as well as a preamp output that could be used to record from or fed into a subwoofer should you feel the need for more bass oomph than your speakers provide. Build quality is generally sturdy. The amp is made of a combination of metal and plastic with glass end-caps. On the whole it looks smart and feels pretty solid, though one of the end caps on our review sample came off. It was easily reattached and is now secure, so we’ll put that down to ours being one of the first off the production line. The amplifier’s speaker terminals feel of good quality and are spring-loaded to make connecting with bare wire easier. The curved shape of the casework and its extended rear lip makes this a little more awkward than it should be. When it comes to sound quality it makes the most sense to start with AirPlay performance, and the results are good. Provided you have a stable network everything works slickly. 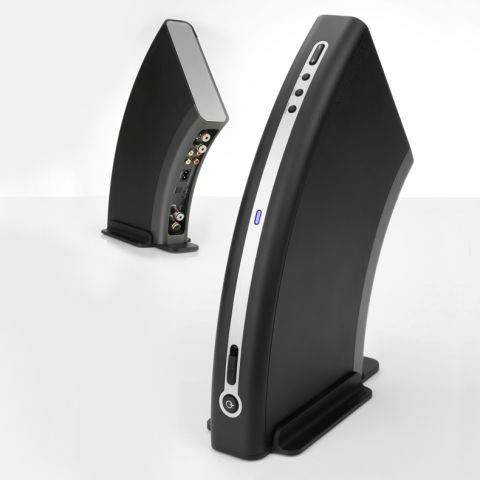 It’s fair to say we haven’t been great fans of AirPlay sound quality and there’s nothing about this amplifier that changes that opinion, but it’s obvious the company has tried hard to make the most of the connection. There’s less of the hard electronic edge we normally hear, and detail levels are fine. The result is a lively and entertaining performance that allows us to sit back and enjoy the likes of Johnny Cash’s Solitary Man. There’s a good sense of detail and energy, with Cash’s grave vocals coming through with a pleasing dose of emotion. It's a captivating listen, but it's not perfect. The Monitor Audio is so intent on delivering the most revealing, refined sound it can, that it forgets to have a little fun. We'd like a bit more punch to the rhythm and a touch more fluidity, It's here that the NAD's bite and ffree-flowing dynamics are a whole lot more fun. This is a 50W-per-channel amplifier – Monitor Audio has chosen to stick with traditional Class A/B circuitry rather than the more fashionable Class D alternative on performance grounds – and it seems to have paid off. The A100 may look like a style-based product but it’s capable of proper hi-fi sound too. It’s the switch to stereo analogue that confirms that impression. We start off with Orff’s Carmina Burana from our reference Naim NDS streamer and are impressed with this Monitor Audio’s punch. It delivers large-scale dynamics with a surprising degree of composure. There’s no shortage of volume either. We used a range of speakers from Q Acoustics Concept 20s and B&W’s 685 Mk2s up to our reference ATC SCM 50s (just for fun, you understand) and this little amplifier takes it all in its stride. This Monitor Audio delivers an unusually wide soundstage and populates it with a decent amount of precision. We’re impressed by its refinement too. This quality isn’t bought at the expense of treble bite, with the highs being delivered with a good amount of sparkle. The tonal balance is nicely even, with no part of the frequency range dominating. We switch music to something less cultured and end up with The Dead Weather’s 60 Feet Tall. We like the A100’s bass weight and grip, as well as its ability to keep the song’s coarse signature in check. By the highest standards at this price – at the moment we rate the Marantz PM6005 the best-sounding amplifier at this kind of money – there isn’t quite the rhythmic precision or drive to make the most of the song, but the result is still enjoyable. We try the optical input connected to our resident MacBook and continue to be impressed. We listen to a range of music from Beethoven’s Moonlight Sonata to Kanye West’s New Slaves and the Monitor Audio acquits itself with honour. It sounds insightful and composed, with enough in the way of drive and dynamics to satisfy. The comparison with NAD’s D3020 is a fair one. Both amplifiers are forward-looking designs, and while there are differences in specification - NAD has Bluetooth and not Airplay - both are aiming for the same market. The lack of Bluetooth might not sit well with some, and on pure enjoyment terms we think the NAD D 3020 just about edges it out. But for this price it's a brave product that performs well and can be used in situations where conventional alternatives wouldn’t even get a look-in. For that alone it deserves plenty of credit.